After Flipkart shut its mobile website, not everyone has been interested in installing the application to check the price, that too once in a while. This is what I experienced at a few stores in Delhi while researching for an upcoming story. 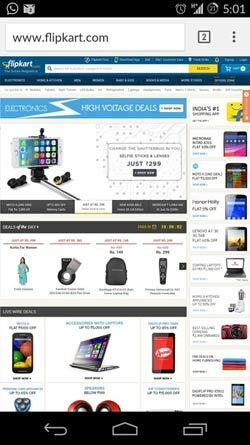 Until sometime ago, the standard way to bargain while buying a smartphone or a home appliance was to cross-check the price on Flipkart from the mobile browser, and then negotiate. After Flipkart shut its mobile website, not everyone has been interested in installing the application to check the price, that too once in a while. This is what I experienced at a few stores in Delhi while researching for an upcoming story. If you experience the same difficulty while checking the price online and are forced to download the app, here is the solution. When you visit the website from the Chrome browser on your Android smartphone, it asks you to download the app. But you can bypass this and access the desktop site right from your smartphone's browser. 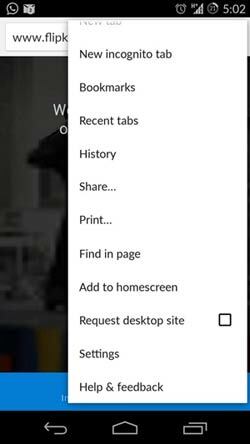 To do this in the Chrome browser, you need to go to the settings and select the 'request desktop site' option. Once done, it will automatically load the desktop site on your phone's browser that was earlier restricted. And it works well. You might have to navigate a bit but your basic work will be done. This not only comes handy for Flipkart but other websites such as Myntra as well. You can even leave this setting turned on all the time if you are more comfortable with the desktop search. Well, it's still some time for popular portals such as Myntra and Flipkart to go app only. Till then, you can continue to browse using the desktop version right on your smartphone.